‘The owl hoots in the darkness, calling out to his mistress with the music of the night. His white feathers gleam in the moonlight as if with a light from within. He glides through the darkness to come to rest near her. In the gloom, the night is full of whispers – the secret knowledge of the stars, of the trees, and of the earth. The spirits of each murmur their collected stories and their wisdom in a sibilant descant. She weaves those sounds through her fingers, drawing the voices into physical being, and in her fingers, a filigree key coalesces. She calls the owl to her. ‘Take this, and be the bearer of secrets,’ she tells him. 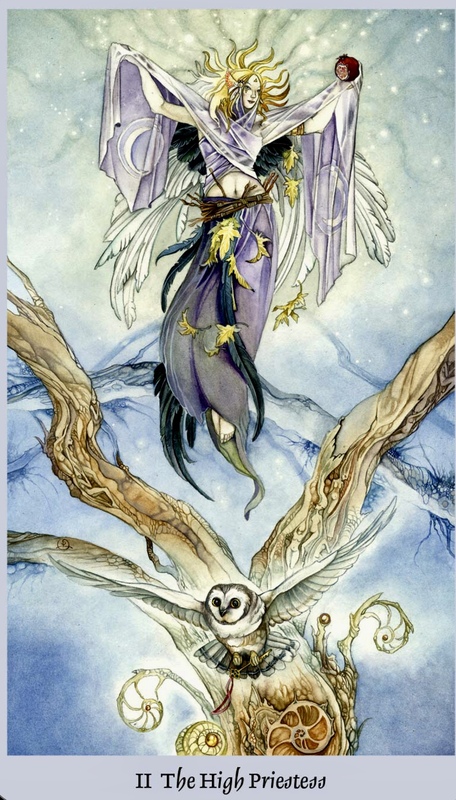 There is openness and receptivity here as she spreads her arms wide, palms to the cosmos and receives what is hers for the taking; knowledge, wisdom, abundance. She rises up above the drama, the watery depths of the third dimension of consciousness, refusing to be caught up in the darkness and chaos. Her hair flows up above her head connecting into the Universal flow, Crown chakra activated and connected. She is both the Sun and the Moon. She has feathers of both black and white, suggestive of the polarity of the physical existence… the isolation, the connection to All That Is. You are the living Chalice, you have the ability to access all that the Universe has to offer, all resides within you. You are a vessel of Love and of Light. You are the beacon, you are the portal, you are the connection. Rise above the mundane, the worry, the doubt, the fear and the drama and find this aspect of yourself. Channel in all that it has to offer you. Lifetimes of the wisdom gleaned from lessons learned. The secrets of healing. The magic and mystery of the Universe.